$26.75* Westminster Smog Check Coupon - 1 Stop Smog And Repair - 13142 Goldenwest Street, Westminster, CA. Phone: (714) 891-8139. Local Westminster Smog Station. First opening our doors... in 1995, 1 Stop Smog & Auto Repair has provided the Westminster community with quality auto repair and smog inspection for over twenty years. 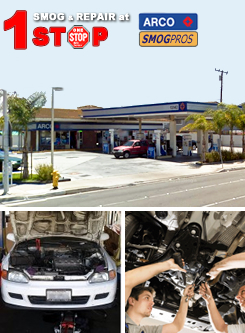 1 Stop Smog & Auto Repair is a complete STAR certified automotive repair center that services all car makes and models. Also, take advantage of our complimentary local tow service with repairs over $200.00 and free shuttle service. Shop Hours: MON-FRI 8:00am to 6:00pm. SAT 8:00am to 4:00pm. SUN Closed. Smog Special: $26.75* with SmogTips coupon! Plus Free retest w/ in-house repairs. Applies to most 2000 & newer passenger cars. 1999 and older $10 extra. Trucks, vans, & SUV’s $5 extra. EVAP test $10 extra. More certified smog station near Westminster, CA.